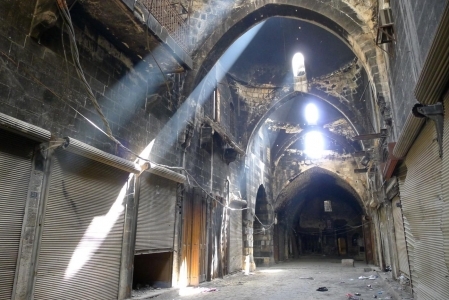 Syria’s ancient Aleppo souk poised to regain its bustle 2019-03-11 | Ismaili.NET - Heritage F.I.E.L.D. Aleppo: On the domed roof of a historical market in the northern Syrian city of Aleppo, architect Bassel Al Daher moves between workers painstakingly working to erase the scars of war. Men wearing vests and helmets repair parts of the roof still bearing visible traces of the four-year-long battle for the former rebel stronghold. They cover its charred surface with a fresh coat of white paint as part of a wider effort to rehabilitate the Saqatiya market, or souk in Arabic. country’s conflict marks its eighth year next week. Russia-backed regime forces that year retook control of the eastern side of the city, much of which remains in ruins. Clashes in April 2013 reduced the nearby Umayyad mosque’s minaret to an unrecognisable pile of blocks. UNESCO estimates that as much as 60 per cent of the Old City was severely damaged. Saqatiya market fared better than most, with 30 per cent battered during the fighting, says Al Daher. It shows signs of major damage but no sign of collapse, Syria’s antiquities authority said in a report last month. Restoration works began on November 1 after Syrian authorities signed a partnership agreement with the Aga Khan Foundation in Syria. Renovations are expected to be completed in July, according to Al Daher. Workers are focusing on erasing all “signs of war” from the market and correct old construction violations. “The broader aim is to bring merchants back to their shops,” he says. Saqatiya market is one of around 37 souks surrounding the Aleppo citadel, the oldest of their kind in the world. They stretch from the western part of the Old City to the gates of the citadel in the east, covering an area of around 160,000 square metres. For centuries, they were the commercial heart of the ancient city and served as a key trading hub between the East and the West, says Alaa Al Sayyed, a historian and specialist on the Old City. The expert, who is also overseeing the restoration, says “they are more than 2,000 years old”. “They are the longest and oldest covered markets in the world,” he says. They consist of dozens of shops, schools, mosques and bathhouses. In their long history, this is not the first time the markets have had to be restored. Over two millennia, they have weathered numerous earthquakes and conquests, but “every time they were rebuilt”, he says. Located in the old quarters of Syria’s second city, the Saqatiya market dates back to the Ottoman period. The Saqatiya souk covers an area of more than 1,500 square metres and used to house more than 50 shops before Syria’s conflict landed in Aleppo in 2012. It is located near other landmarks of Aleppo’s Old City, a UNESCO-listed World Heritage Site that served as a frontline during clashes that ended in 2016. The celebrated citadel, a jewel of medieval architecture whose surrounding wall was damaged by a blast in July 2015, is visible from the market’s roof. The Umayyad mosque, an ancient site that dates back to the 11th century, is within walking distance. Salamiyah, Syria is playing host to a unique kind of contemporary art exhibition.